Just under two weeks before Good Friday we received a liturgical distress call by way of a doctor who helps us with sports injuries (brothers play a lot, brothers twist ankles, lots of brothers, ergo we really appreciate all the medical help we can get). 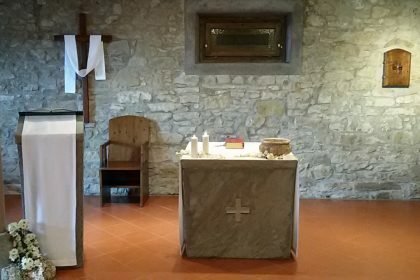 A community of consecrated lay women (not Regnum Christi, my movement) needed a priest to celebrate the Sacred Paschal Triduum for them in Montepiano, a small community to the north of Florence. 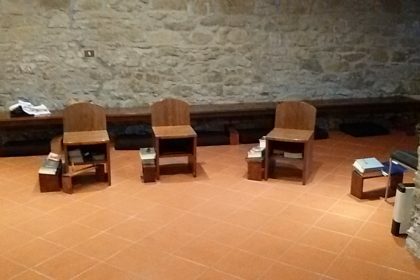 I wasn’t sure what to expect, but I convinced myself due to an initial miscommunication that they were cloistered Carmelites, therefore going to the parish was not the ideal option for them (if at all), and volunteered to go, since one of my dear friends is a cloistered Carmelite nun in Valparaiso, Nebraska. I had already celebrated the Sacred Paschal Triduum four times: twice in the United States as chaplain for Overbrook Academy, and twice in Switzerland for a group of English-speaking girls from Overbrook’s sister academy in Ireland, Woodlands (who were in Switzerland for a ski trip). 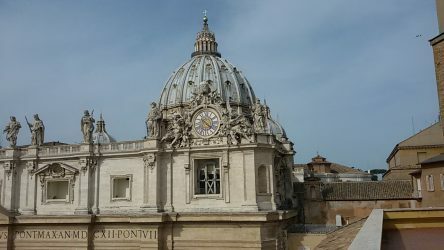 Liturgically the Sacred Paschal Triduum is one of the most complex moments of the year, since Easter is considered the feast day of feast days, but after four times I wasn’t too worried. 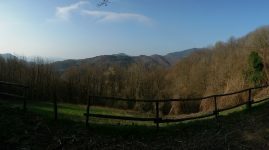 The plan was to ride up to Montepiano with the doctor on Good Friday, celebrate the Sacred Triduum, and then ride down with him on Easter Monday morning. That was how it worked out for me, but he had a lot more driving to do. Two days before the trip his elderly mother had heart problems and the day before the trip she had a pacemaker installed. He didn’t tell me until Good Friday morning when he came to pick me up (please keep the family in your prayers; she is doing much better now). 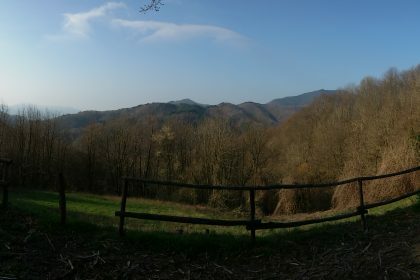 God bless his generosity; he dropped me off in Montepiano (almost four hours driving), returned to Rome to be with his ailing mother in the hospital, and then he returned early on Easter Monday to bring me back to Rome. 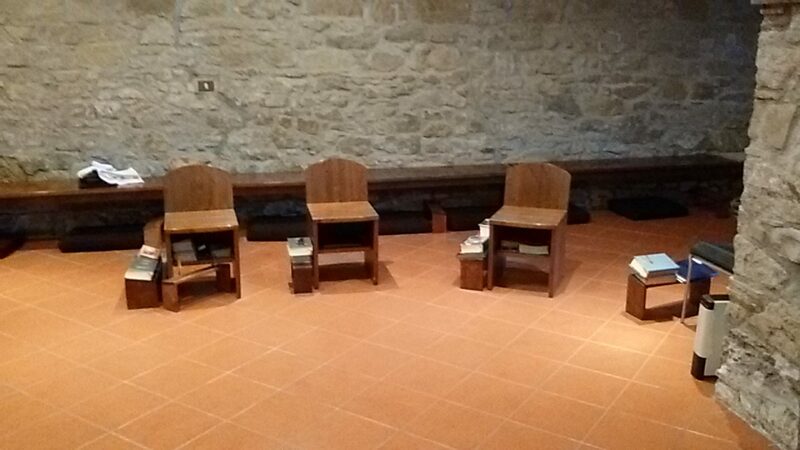 Upon arrival I found out the “cloistered Carmelites” were actually a community of consecrated lay women, the Little Community of Mary, Servant of the Lord (in Italian: Piccola Communità di Maria, Serva del Signore). 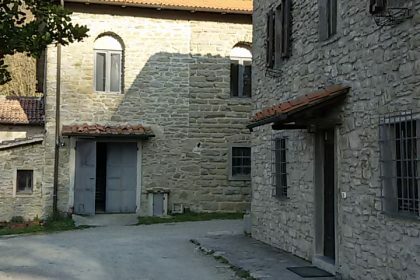 They’d been founded in Umbria but now were in the diocese of Prato. These were the only ones. 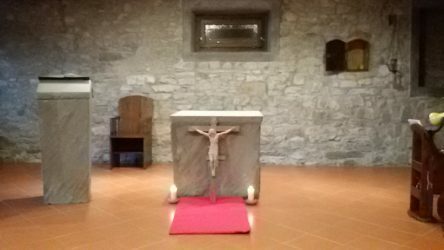 They prayed the Divine Office together at times during the day, spent quality time in front of the Blessed Sacrament, and also worked around the property that was a sort of country ranch before they moved there. One of them cast the Paschal Candle we used from beeswax and was also a carpenter. 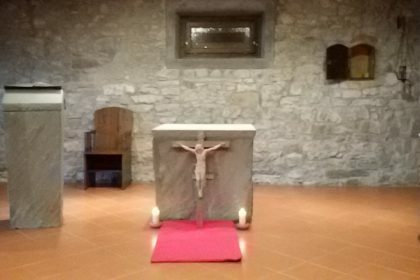 They had their duties and projects and attended to them in prayerful silence, therefore is was a pleasantly quiet place to stay, simple but joyful. The most potential anxiety came from learning the Exsultet, the Solemn Easter Proclamation in Italian. I learn music by ear and had a hard time finding a recording, but in the end it worked out, although I improvised a little based on how I’d learned the melody in English. 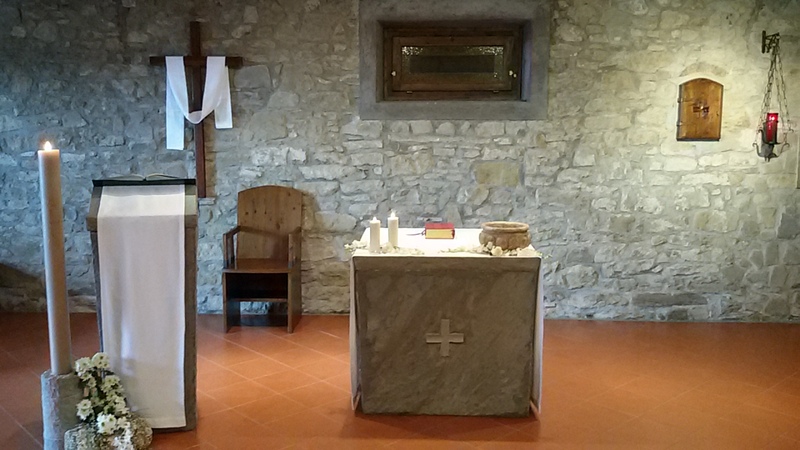 The liturgies were small (a dozen people at most), but simple and beautiful. At the end of the Easter Vigil I was asked to bless some eggs, an Easter tradition, and then I brought Jesus back to the tabernacle where he belonged. 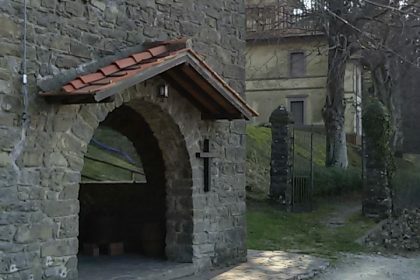 They had arranged a snack and asked me to come and bless the snack, some giant chocolate Easter eggs and panettone (a delicious fruit cake, in this case the Colomba di Pasqua variety). They told me the “blessing” they wanted was for me to break the chocolate eggs first so they could be distributed, kind of like when the wedding couple cuts the cake (it was a good thing I hadn’t been asked to bless the real eggs second; I would have smashed them). So after my best karate chop we enjoyed some chocolate to conclude the evening and welcome Easter. 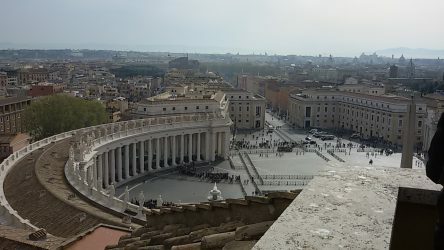 The following Saturday, back in Rome, one of my confrere’s who works in the Vatican arranged for a tour for us of the Vatican Loggia. I stood in front of the wooden doors to the Sistine Chapel that everyone saw on television a few years ago when the conclave began to elect Pope Francis. 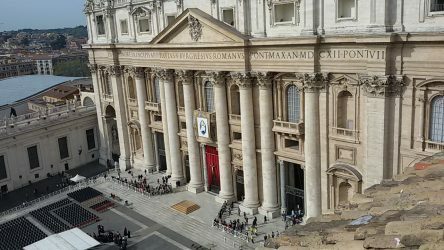 Unfortunately I can’t share photos of the Loggia because they’re copyrighted and I don’t want to find out if there are Swiss Guard special forces, but I can share some views of St. Peter’s Square from a new perspective.